A dynasty fantasy football podcast. Peter Howard (@pahowdy) and Jake Anderson (@NFLDraftTalker) discuss players from both an analytical and film perspective. 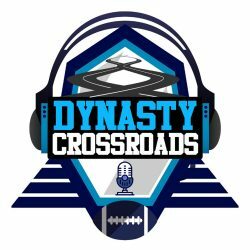 On Episode 35 of the @dynocrossroads, @pahowdy and special guest @tacitassasin13 from the Dynasty Dummies break down Purdue, WR, Greg Dortch and Iowa State, WR, Hakeem Butler from a film and analytical perspective. We are a proud member of the DLF Family of Podcasts!